Theres a plan being hatched that STREET HOBOS will be coralled and billeted in HOTELS in DAVAO once the Miss UNIV kicks off. 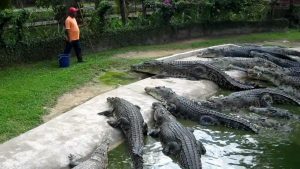 Theres a proposal as well to send members of CONGRESS on much needed vacation to DAVAO……CROCODILE FARMS. For the first time in history, the MAJORITY PARTY in CONGRESS elected DANILO SUAREZ as minority floor leader. With such in mind, a neophyte lawmaker made her call for the establishment of humor wards in all hospitals nationwide to help patients relax and aid them in dealing and accepting pain. It was suggested however to cover the HOUSE proceedings and beamed live in hospitals to show case the antics of the CLOWNS in CONGRESS instead. “We save money in the process,” suggested a clown who wished to remain anonymous. Quezon 4th District Representative Angelina Tan filed House Bill (HB) Number 1035, which seeks a nationwide ban on the playing or operating of any karaoke systems, loudspeakers, musical instruments, and other sound amplifying equipment after 10 pm in residential areas. Gen. Bato on the other hand wants DRUG PUSHERS to sing MY WAY prior to their arrests. MANILA – A former lawyer of the late strongman Ferdinand Marcos said the former president’s remains must be allowed to be buried at the Libingan ng mga Bayani. Obama: Hey Die-Gong, I heard you’ve notched 2000 so far? Putin: Keep your mouth shut Barry. Leave Die-Gong alone. You’re running for reelection no more. Obama: Hey Vlady, why don’t you help Hillary win in November? Putin: Why should I do that Barry? Obama: The Donald is easy on the trigger and you’re in his nukes-crosshair. Putin: (Turning to Duterte) Hey Die-Gong, stop mentioning my name whenever your angry, like, Putin Ina mo and Putin-yawa…..we’re friends, remember? Obama: Hey Die-Gong, what’s its like when you have Durian? Duterte: It’ll make Michelle happy, Barry. Expected to attend are some 3.7M members bigger than the EDSA REVO turn out. Speakers from CHINA, TAIWAN, and HONGKONG are expected to attend. “Si Melvin nakita pa namin na nakatayo, dumaan pa pero hindi namin makausap. Nakita namin dumaan naka-posas pinasok sa sasakyan. Tapos dinala ng hospital. Pumunta kami sa Kalibo pero ‘yon pala dinala sa Malay hospital. So noong bumalik kami sa Malay, patay na silang dalawa. Tinanong namin ‘yong doctor, dead on arrival na raw,” Odicta’s lawyer said. Have you heard about PALIT ULO or switched suspects? This is done where the arrested DRUG LORD has so much to offer financially. This is done when the arrested DRUG SUSPECTS are foreigners and in exchange of millions, they are allowed to fly out of the country. The script fits that of the ODICTA COUPLE who are now in Switzerland. Of course this is a joke. DU30 wants the DEATH PENALTY back by hanging. Now he wants D5 to go hang herself….is he telling us that he’s a Hang President? When KORINA heard abt the presidential attribute, the black of her eyes vanished…..